This week’s review was brought to me by my fellow writer on the site Tony. He knows that I am a huge fan of Danger Girl, and figured this series looked like a similar style of book. Deep down Victoria’s Secret Service feels like it wants to be more than it is. 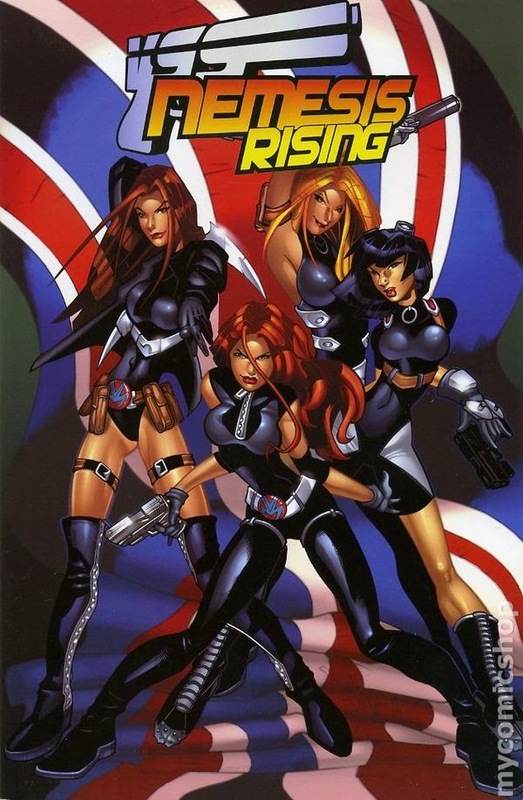 When what it is is a really fun more british version of Danger Girl. It follows a group of four girls from different countries and backgrounds who work for a highly elite spy organization known as Veil. Of course they all have specialties that make them valuable to the team. For example Raven is a dark haired tech specialist. I believe she is supposed to be Asian but it is never actually said. Then there is Brooke who is a brown haired martial arts expert. Lark, a blonde weapons expert. and Scarlett a red haired former cat-burglar from Atlanta, Ga. Throughout the series the girls take on the forces of their arch nemesis Lord Mann. Most of which come across as stereotypes. But the main story has the Veil agents protecting one of the royal family from being kidnapped by terrorist group known as the C.L.A. of course shenanigans do ensue and the agents all have to use their talents (and good looks) to save the day. So just your basic Danger Girl style story. The only downside to this series is the accents that are being portrayed make it hard to read from one dialogue bubble to the next. So at times I found myself going back a couple of panels to read the dialogue and make out what was being said. The writing is decent, but nothing super special. The characters come off as a little one note every now and then, and sometimes it gets a little confusing to figure out which accent belongs to which girl. I would like to see how the writing of Griep and Davis could evolve from here. As for the art in the six issues that were in this volume each issue had a different artist. And none of the issues listed which artist did which issue that I saw. That said all of the art was pretty good. The girls were easy enough to tell apart as long as you could see their hair. Because other than having their own distinct hair style all of the girls pretty much have the same basic body type. Though some try to replicate J. Scott Campbell style where others go for a Adam Warren style approach. While not perfect, Victoria’s Secret Service was a fun read. I suggest giving it a look if you like books like Danger Girl. But for the most part it made me want to go back and read all of my Danger Girl trades.